Early this week my home server (a Linux machine) threw a kernel panic. Yesterday is happened a couple of times. Then all of a sudden, when I plugged a USB stick in to run a memory test, the monitor stopped coming on. Now whenever I turn it on, the system gets power...I heard the drives spin, I see the processor fan spin, and the hard drive light comes on...but nothing happens. I put a video card in the AGP slot, but still nothing. The light on the power button that usually comes on stopped coming on. I took the memory out to see if it would beep, but nothing beeped. It's like it's getting power, but it's not coming on. Does this sound like a motherboard problem to anyone else? It really can be anything and is hard to diagnose remotely - but it does sound like the motherboard. 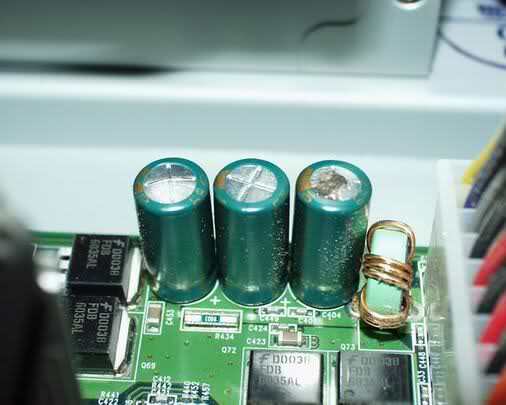 As I just suggested in another post, when it comes to random problems that you cannot figure out easily, I would always suggest a quick look at the motherboard for blow capacitors. The top should be almost flat (with slight indents out embossed sections depending on specification... look at the middle one) but you do not want to see any big bumps such as the first one or any leakage as the last one. Before spending too much time taking parts out, and testing everything individually, take a good look around at the parts and see if anything is odd. Definitely sounds like a motherboard problem, but it could also indicate a power supply or CPU problem. I'd strip the system down as far as you can (disconnect all drives, remove any PCI cards except possibly video), try it on a different PSU if possible, try it with a different CPU if possible. You can probably "borrow" a PSU from a home desktop system. If you don't have (or can't get) replacement parts, though, you should look at replacing the motherboard/CPU entirely. Could be motherboard, could be power supply. Could even be a really badly failed hard drive that's shorted and drawing so much power it prevents booting. If you have a multimeter or can borrow one, you can check the power supply outputs directly. From your description it appears you do not even get to the BIOS bootup splash. This means, your board has not boot-up even to the point of passing primary board tests. Stripping down the machine is the best way to go. If there is a power-overload from one of these things it will show up. Now, power on and try a boot. Do you hear any beep? Did it beep any time before it went bad? (that would reassure us that the PC Speaker wiring is fine). but are there any LEDs on the board itself? does any thing else light-up or flash? Look for the RESET button (not the power button) and click it gently once. Do you see any difference in the system? Does it appear to have taken a reset and restarted the boot attempt? You should first suspect the Power-Supply. Finally, you could get your motherboard number and update that in the question. Not the answer you're looking for? Browse other questions tagged linux motherboard kernel-panic or ask your own question. PC starts (fans, lights), reboots, then hangs - motherboard damage? Can a faulty motherboard kill the CPU fan?